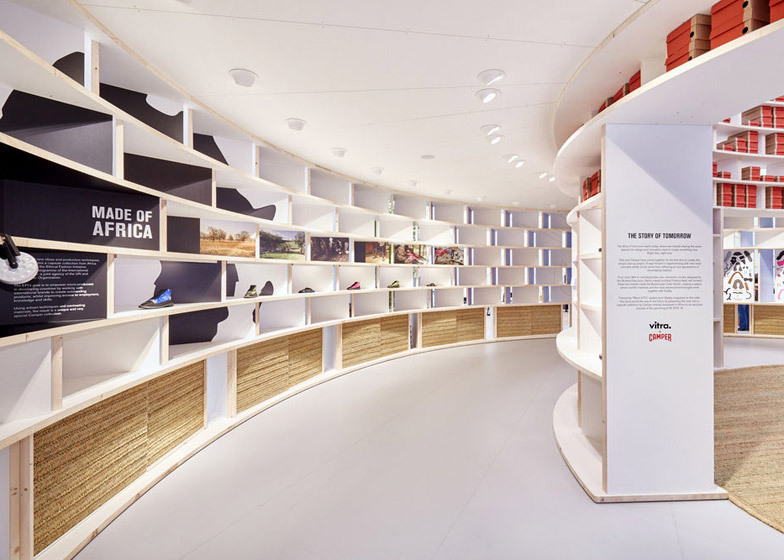 Burkinabé architect Diébédo Francis Kéré has created a temporary retail space for shoe brand Camper inside a domed building at the Vitra Campus (+ slideshow). 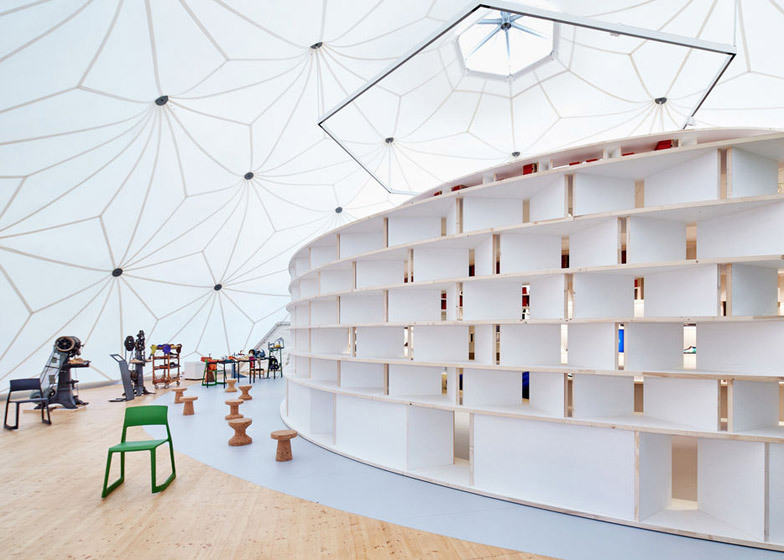 Kéré's installation, which opens today at the Swiss furniture brand's headquarters, comprises two ring-shaped structures filled with shelves for displaying both information and shoes. It was constructed to coincide with the Making Africa exhibition at the nearby Vitra Design Museum, in which the architect's work is featured, and the Camper: Life on Foot exhibition at London's Design Museum. 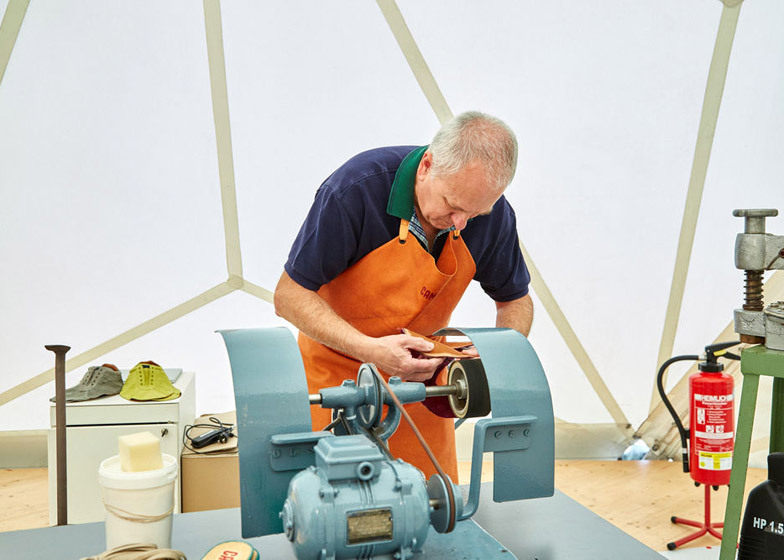 "The Vitra and Camper pop-up project gives visitors to the Vitra Campus a chance to experience a real-life example of Kéré's work," said a statement from Vitra. Originally from Burkina Faso and now based in Berlin, the architect built the shop and exhibition space inside a structure originally created by dome specialists Charter Industries in 1975. The dome, which was previously a car showroom, has a design that explores similar construction principals to the geodesic domes by American Neo-futuristic architect Buckminster Fuller. 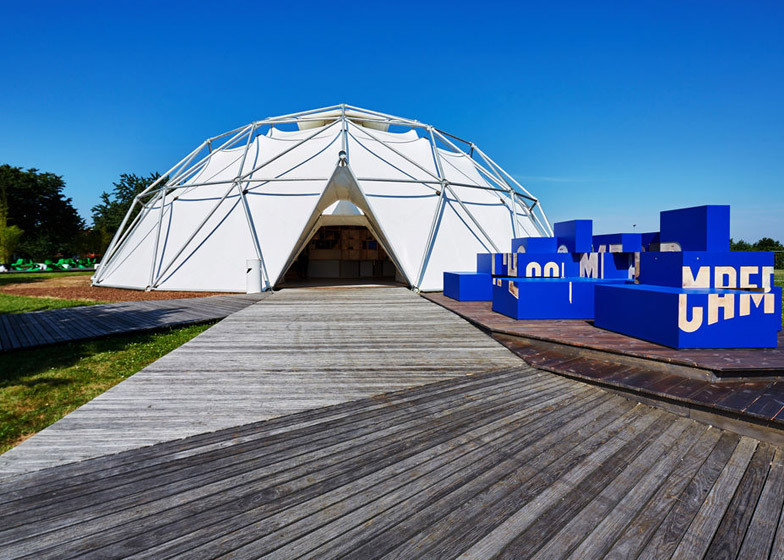 The tent-like structure is held up by a triangular grid of aluminium poles, and was added to Vitra's campus at Weil am Rhein, Germany, in 2000 to provide a flexible event space. Accessed through a triangle-shaped opening in the material, the dome is currently hosting Kéré's two connected oval structures. The concentric shelving units are constructed from a wood-based material called blockboard – made by Vitra-owned company Vizona – with larger surfaces covered in white laminate, while the wood grain is left exposed along the edges. 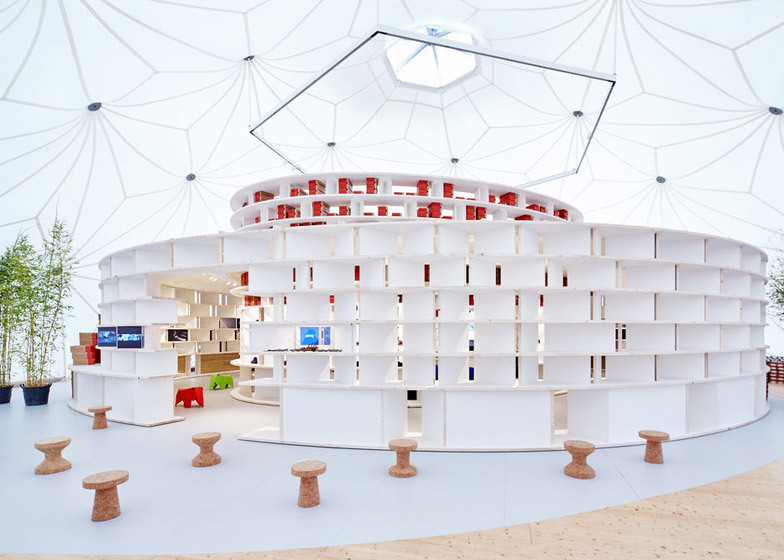 "The structure provides a surface area for multimedia brand messages as well as the presentation of merchandise," said Vitra. "At the same time, it serves as storage space and allows the integration of a welcome desk and seating." 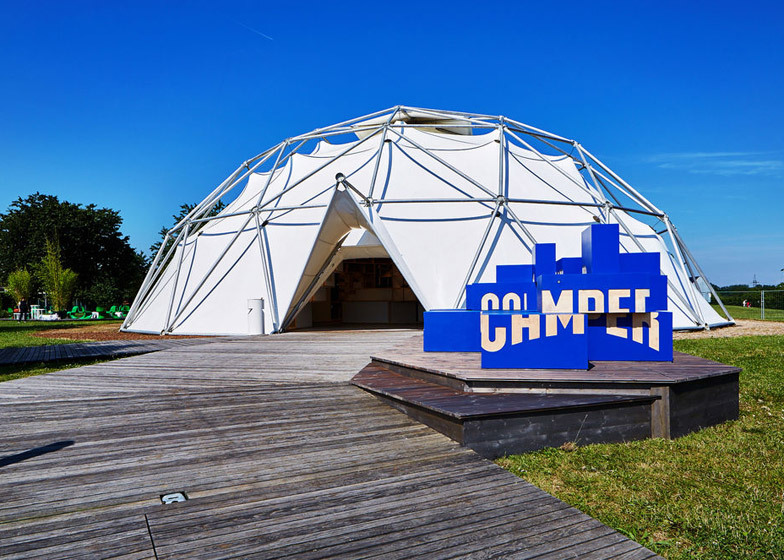 The wider, lower ring contains teasers from the two exhibitions, including samples of Kéré's work and examples of Camper's stores by designers including Kengo Kuma, Nendo and the Bouroullec brothers. 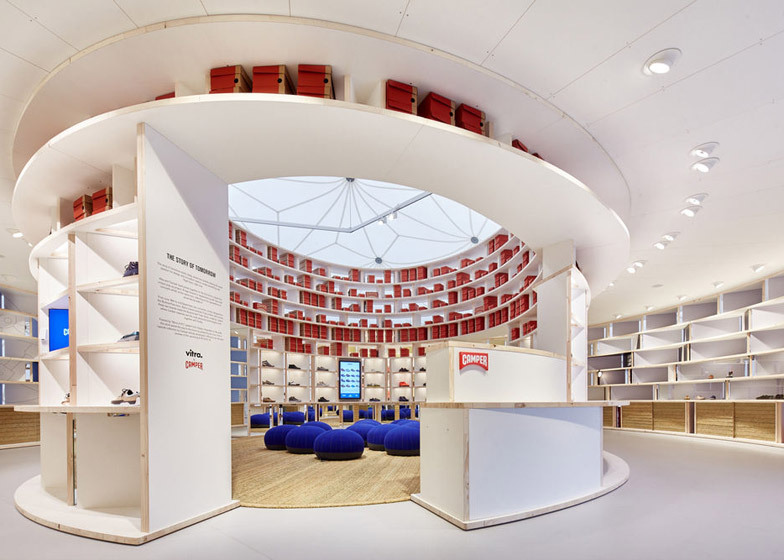 The taller inner structure displays designs from Camper's Autumn Winter 2015-16 range towards the bottom, and stacks of the Spanish brand's signature red shoe boxes around the top. "The zigzag configuration of the vertical panels determines the shape of the individual compartments and makes it possible to utilise both sides of the shelving wall," Vitra said. Multiple gaps in the structures allow access to the central space, which is open at the top to let in the light filtered through the translucent dome. In this area, a woven seagrass mat covers the floor and rounded blue stools can be used by shoppers trying on the footwear. 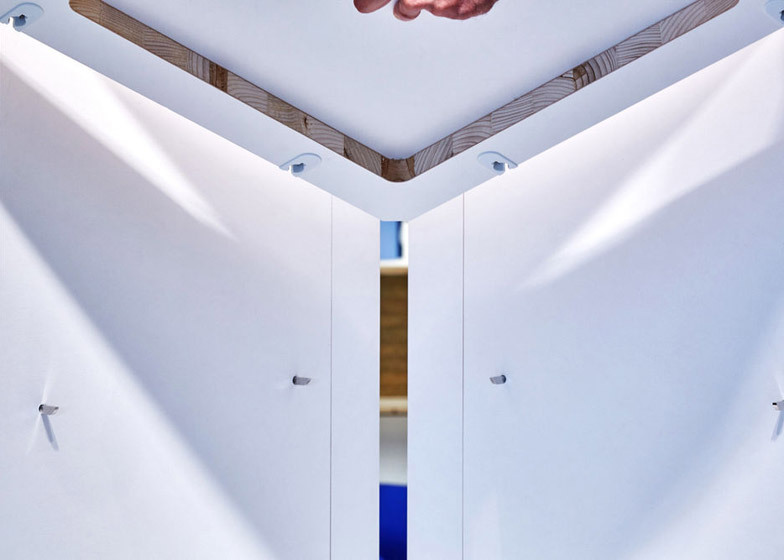 Mirrors on either side of the openings are provided to help with decision making. Products from the United Nation's Ethical Fashion Initiative, promoting the work of artisans in countries such as Ethiopia and Haiti, are also on show. The outer area is hosting live shoe-making demonstrations to allow visitors the chance to see cordwainer's techniques in action. Cork stools and potted plants are also dotted around the internal space. The Vitra Campus comprises a group of buildings, pavilions and structures designed by some of the world's most famous architects. Along with older projects by Zaha Hadid, Herzog & de Meuron and Tadao Ando, recent additions have included a viewing tower with a slide by Carsten Höller and a tiny wooden cabin by Renzo Piano. The Making Africa exhibition at the Frank Gehry-designed Vitra Design Museum runs until 13 September 2015. 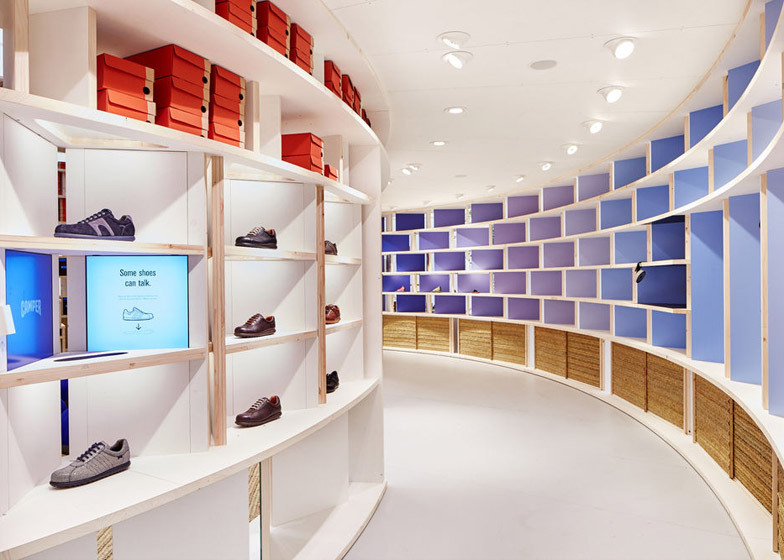 Camper: Life on Foot is open at the Design Museum in London until 1 November 2015.